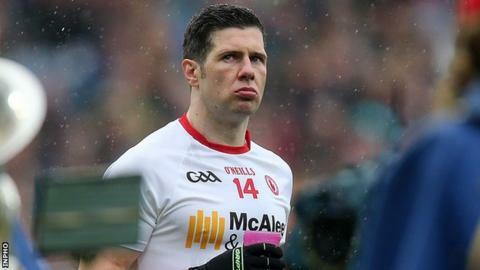 Tyrone captain Sean Cavanagh has been at the top of Gaelic Games for 14 years - and has the medals and bruises to prove it.He believes the current Red Hands side can achieve more success in 2016 and has decided to help them do that. I like Sean Cavanagh. I like him as a footballer, I like him as a man. In an era of closed-book and blank-page banality, of cat and mouse interviews, he effortlessly opens a big wide window into his world, invites you to dive through, rummage around and hand-pick a precious pearl or two. We meet mid-afternoon at his old school, St Patrick's College, Dungannon. I'm early and shoot the breeze for a bit with Cavanagh's former PE teacher. "Sean, he's a one off, brilliant basketballer, brilliant student, great strategist, born winner, born leader." An accountant by trade, clothed in a sharp silver-grey suit, he ambles to the playing fields. There is something at once captivating and incongruous about Cavanagh. Like an inquiring child on day one of "big school", he is also wearing that gawky curious smile which so often franks his facial furniture. He seems oblivious to the buzz he has created, or maybe more accurately opts not to notice. "You ready to go toe to toe?" I say. "Shoot," he says, "no no-go areas." I did and had we won the All-Ireland I would have. I talked it through with my wife she and my two daughters have given me their blessing. I see the energy and potential in Tyrone and feel we won't be too far away from silverware in 2016. I'm not a great person for reflecting on stats records or awards, I have never watched a full game I have played in back but I have loved every minute. Do Tyrone have an image problem ? Whenever you penalise players for diving, or people talk about it being cheating, you have to apply the same rule to every player on every county team and I personally don't feel that has happened. Has a witch hunt been going on at times? It is maybe a fear that whenever a Northern team can go down and compete with the best. It was only when we beat Monaghan that it really exploded because, maybe this team could go and do what it did in 03, 05 and 08. I have got a four-year-old daughter who's now in primary school. Whenever your four-year-old is looking up at you and saying 'Daddy that man on TV is saying you're a cheat', then it hits home. I've always tried to be as honest as I can on a football field. Pulling Conor McManus down in 2013? You've been spat on during a big match? Yes. I won't name the individual involved, but during a televised game I have been spat on for probably 70-odd minutes, maybe 20 or 30 different occasions. I'd admit I'm no angel, but I have certainly not spat on anyone. I'm no shrinking violet but personally I would love to play a game in which there was no sledging, no cynicism, no dangerous tackles. But you have engaged in cynical play? Yeah completely. What I would say about that is the amount of times its happened to me, it just begins to rub off on you, I think it's part and parcel of our game. I think the best teams - Dublin have it, Kerry have it - I think we can help ourselves. I have always said referees need help. Do you ever wish you were paid ? Not one day Mark. On three separate occasions I have been offered professional contracts to sign. but it didn't entice me because I do love Gaelic Games.